October 30 is the 57th anniversary of the “Tsar Bomba” test, the world’s most powerful nuclear test. Its story and legacy provide insights into how nuclear weapons function as both weapons and political tools. 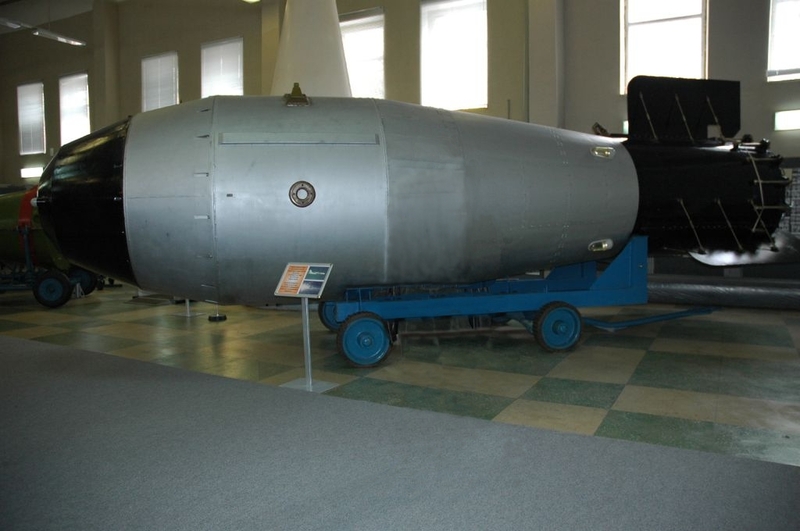 A replica of the bomb, on display at the Museum of Nuclear Weapons in Sarov, Russia. In 1961, political tensions were high between the United States and the Soviet Union, but both countries had had moratoriums on nuclear testing in place since 1958. But with relations deteriorating over the status of West Berlin, the Soviet Union resumed testing on September 1st. The Tsar Bomba test was designed to display the might of Soviet science and as a propaganda device just as the 22nd Party Congress was drawing to a close. By any measure, Tsar Bomba was very, very big. Its approximately 50-megaton yield dwarfed the previous largest detonated nuclear device, the United States’ Castle Bravo, which was a mere 15 megatons. The heat produced by the bomb was felt by one observer 170 miles away from the detonation site, and it was intense enough to produce third-degree burns as far as sixty-two miles away. Although the test was meant to be a demonstration of the state’s power, the Soviet Union detonated the bomb without clear knowledge of its yield. More startling, rather than relying on their own internal measurements, Soviet reports relied on the U.S.’s yield estimate of the test, 57 megatons. For more than 30 years the Russian government used this number until they publicly replaced the estimate at 50 megatons in 1991. The sheer magnitude of damage of Tsar Bomba was unprecedented, but its size and weight made it practically useless as a weapon. The plane that delivered it had to be modified so it would fit, and the long flight to any of the US metropolitan areas where a blast of that size might be considered useful to planners was impractical, if not impossible. Its value, and the reason it is remembered today, lay in its perception by observers in the United States and the Soviet Union as terrifying, incontrovertible proof of the technical and military might of the Soviet Union. Ironically, this fearsome force could only be unleashed on the territory of the country that wielded it. At the time, the bomb went by many names, but “Tsar Bomba” was not one of them. That name didn’t come into common use until the end of the Soviet era, when its pre-Soviet, Russian imperial connotations were more palatable. The origins of its current name are not clear, but both Russians and Americans have embraced it with enthusiasm when discussing memorable moments of the Cold War. Like the Cold War itself, the legacy of Tsar Bomba is the product of Russians and American cooperation, and the significance of the test, down to its most basic details, is firmly situated in the U.S.-Soviet relationship. Its mystique drew on a legacy of miscommunication and attempts, not always successful, to anticipate and interpret the plans and intentions of the other side. The bomb’s history can be read as a testament to the potency of nuclear explosions as political signals, to the enormous potential of international cooperation to remake the world, for better or for worse, or simply to humans’ enduring fascination with large explosions. When it was detonated, it shattered windows hundreds of miles away; decades later, it echoes through discussions about how nuclear states use the threat of annihilation to achieve political aims.